We've incorporated specially built heavy duty non skid material on the entrance ramp and on the entire jumping mattress virtually preventing the kids from slipping. The 15'L x 10'W bouncer has a basketball hoop and drainage system built in. Become an awesome water slide and bouncer by simply connecting the pool and attaching a garden hose(wet version rented separately). With the pool attached kids can bounce, climb up the ladder and push off onto the 32'sliding lane whipping around a 90° turn and splashing down into the pool. Detach the pool and use it as a dry bouncer and slide. 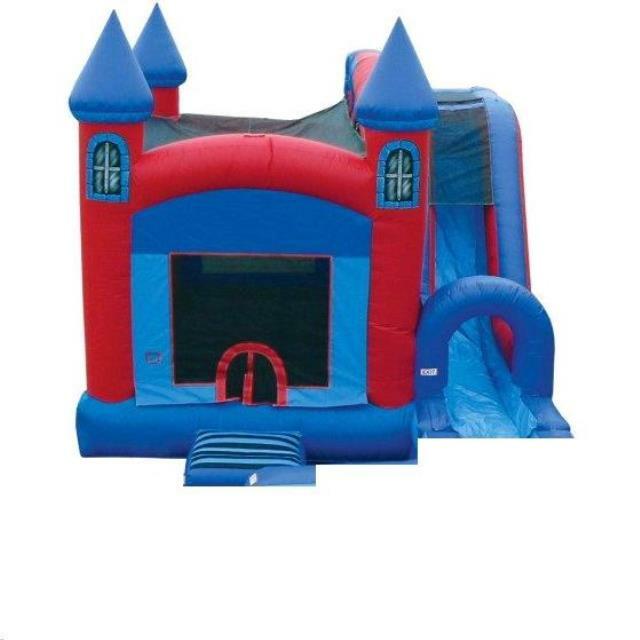 * Please call us for any questions on our inflatable jump n splash castle w/ slide rentals in Cornelius NC, Lake Norman, Mooresville, & Davidson, North Carolina.